​Sergeant, Company C, 7th New Hampshire Infantry. Citation: Gallantry while in command of his company during a reconnaissance toward Richmond. 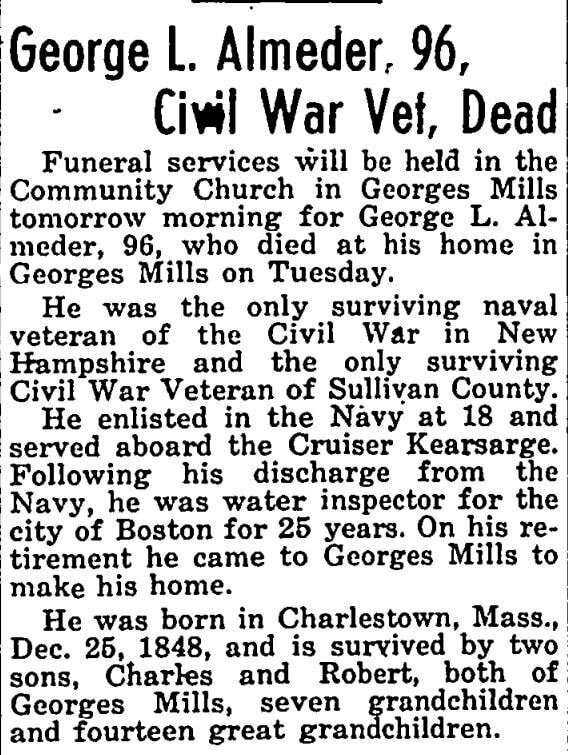 George P. Dow of Atkinson, N.H. enlisted as a private on 14 Oct 1861, in neighboring Plaistow, NH. 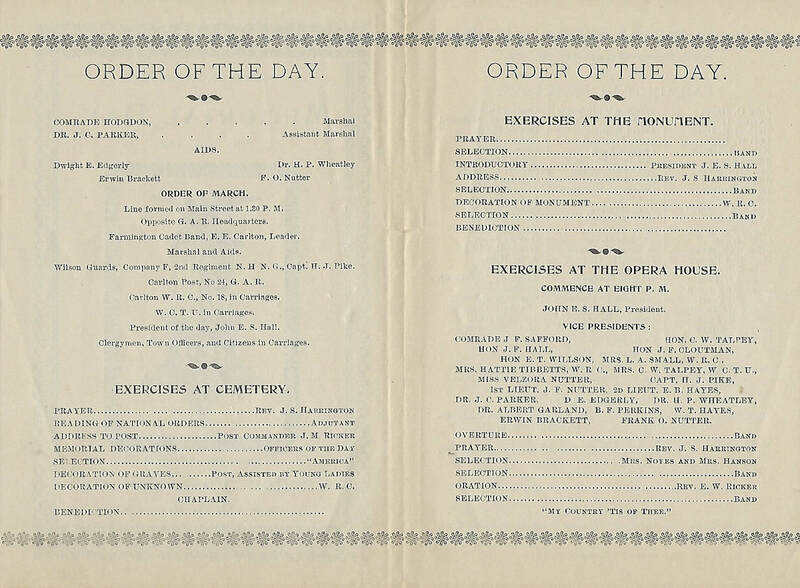 He was mustered in on 6 Nov. in Manchester, and was soon promoted to corporal. On the 18th of July, '62, he was again promoted, to 1st Sergeant. He was mustered out of service on 22 Dec 1864. He had been wounded several times during his three years with the regiment, though not injured bad enough to remove him from active duty. In October of 1864, while in command of his company, which held the extreme left of the regimental line, the unit became separated from the others while on reconnaissance in the vicinity of Richmond. Upon reaching the enemy breastworks they halted, then realizing the rest of the regiment was not behind them, and called a retreat. Being the first of the Union troops to reach that close to the city, the information gathered was of great importance once they returned to their lines. George was a farmer in Atkinson, later becoming the proprietor of a country store in town, and was its postmaster for 26 years. His former homestead still stands, across from the town common named for him. 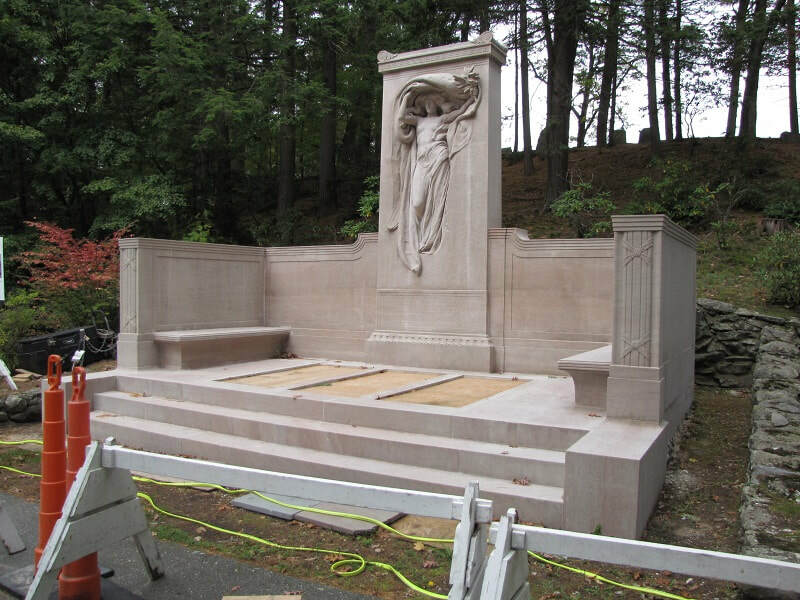 The MELVIN MEMORIAL is located at the Sleepy Hollow Cemetery in Concord, Massachusetts, a monument created by sculptor Daniel Chester French and architect Henry Bacon on behalf of James C. Melvin, who lost his three brothers during the Civil War. 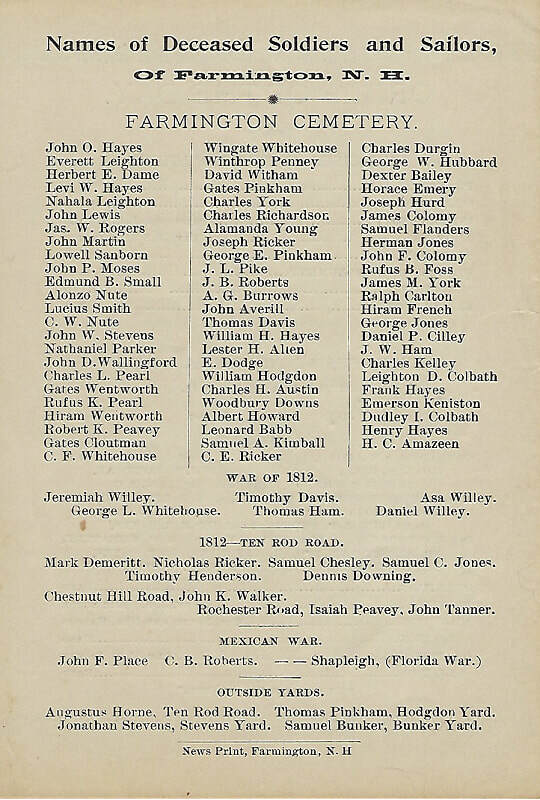 It was dedicated on 16 June 1909, the date when one of his brothers was killed in battle, and was attended by many survivors of the 1st Mass Heavy Artillery (his brothers' reg't), as well as the local GAR post members. 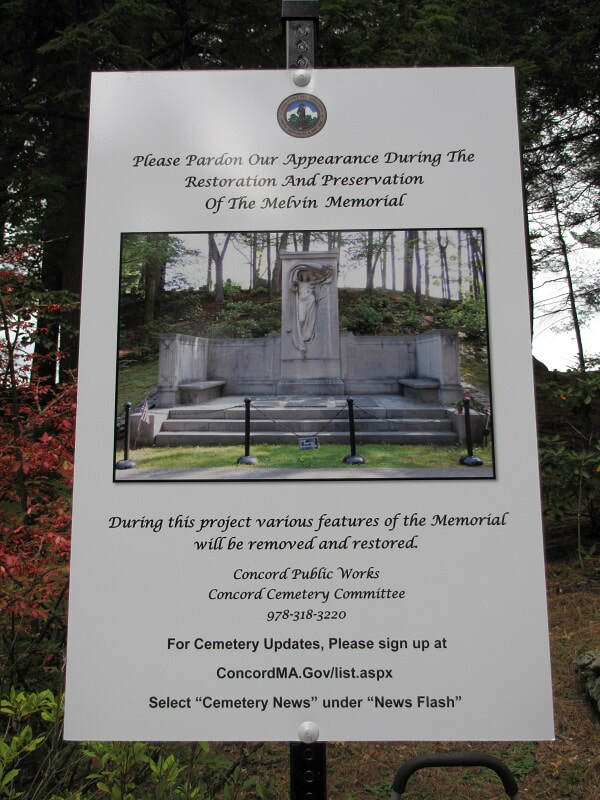 As can be seen in the photos, there is major restoration work being done on this monument. The original dark slate tablets were inlaid with bronze muskets and wreaths, the inscriptions for each brother also made of the same material. 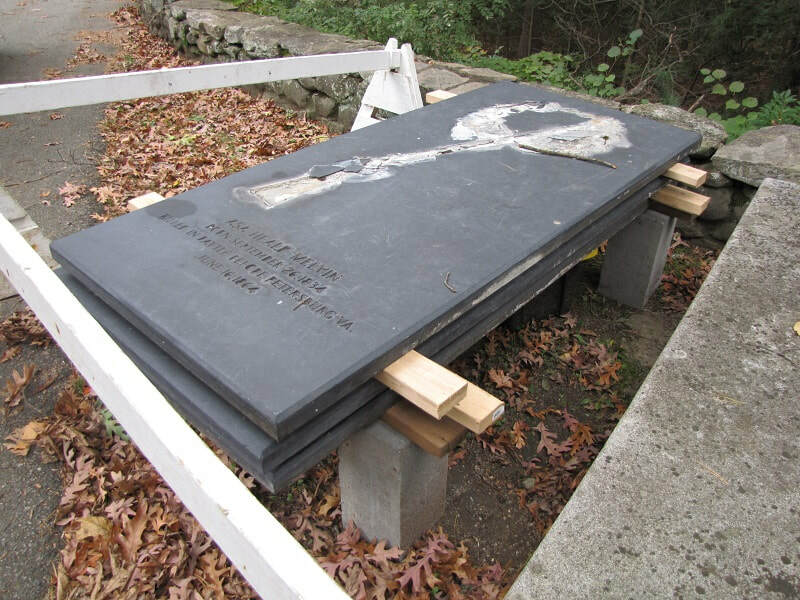 From the one slate that was viewable when I visited, the bronze is heavily damaged and, hopefully, will be part of the restoration. NOTE: the current tablet now has the date of birth date for Asa inscribed upon it, which was not on the original (photo is in the 1909 book). taken prisoner at Harris's Farm, VA. 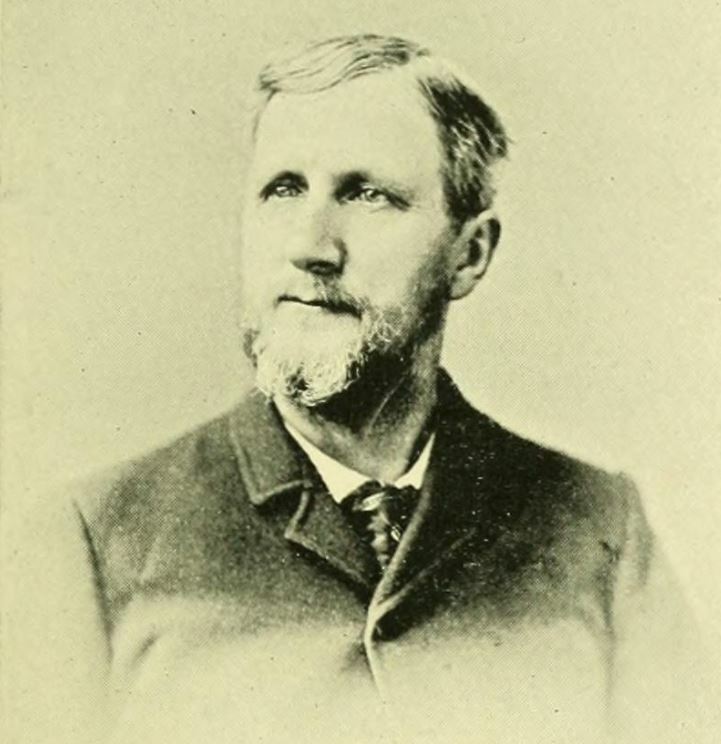 Youngest brother James would also enlist, with Co. E, 6th Massachusetts Infantry, serving from 11 July 1864 to 27 Oct 1864. 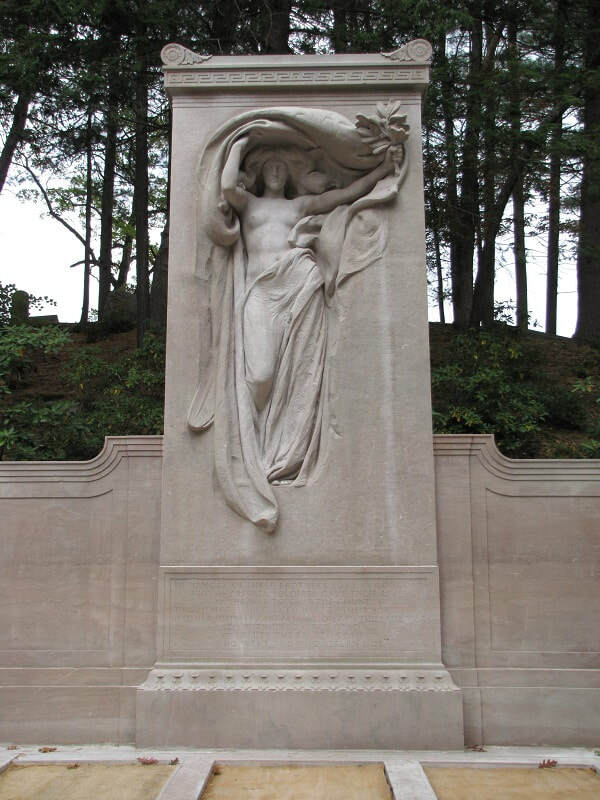 He died in 1915, and is buried in Sleepy Hollow Cemetery, in the plot of his parents. Only one of his 3 brothers, John H., would be returned home to be buried. 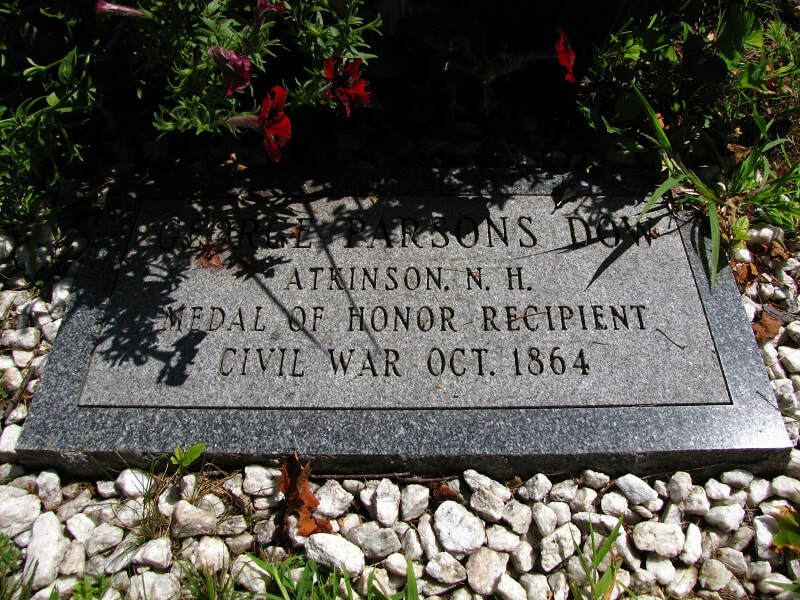 Samuel lies in Andersonville National Cemetery, while the grave of brother Asa remains unknown. Father Asa Sr had died in 1858, and his wife Caroline died in February of 1863, before any of her children perished in the war. 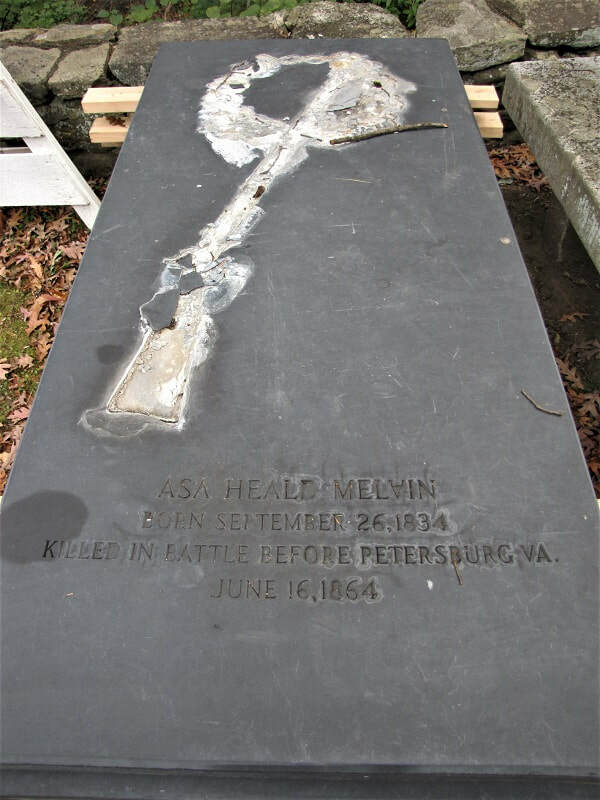 - Find a Grave entry for father Asa Melvin, with links to his children's memorial pages. 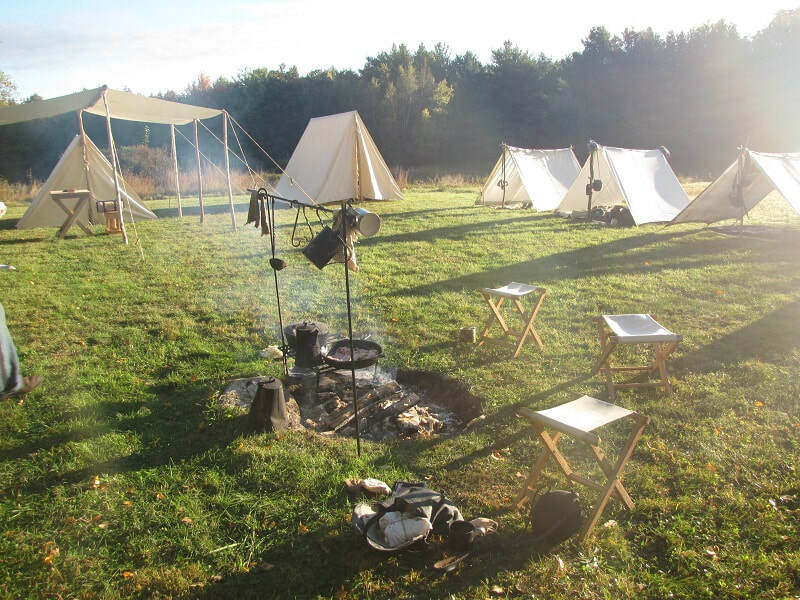 It was the first weekend of October and, as they have for fifteen years past, the men of Company A, 12th New Hampshire Infantry, gathered in the field behind the Cullimore Farm on New Durham Ridge for a living history Civil War encampment. I joined them again, this my 7th year. Begun in 2003 as a fundraiser to place a Civil War monument in town [see New Durham Monument page], the money now being raised through the bake sale held by members of the co-hosting New Durham Historical Society during the two-day event goes towards the Civil War Memorial Scholarship Fund [Attn: The 2019 application is up, if you're a graduating New Durham senior and plan on attending college]. In recent years, the group has been portraying a camp of the "Provost Guard", a unit of men detached from the 12th NH to guard the vital railroad station and powder mill in town, as well as arrest any deserters finding their way back home. This camp would have served as the quarters for those members of the unit who were off-duty. 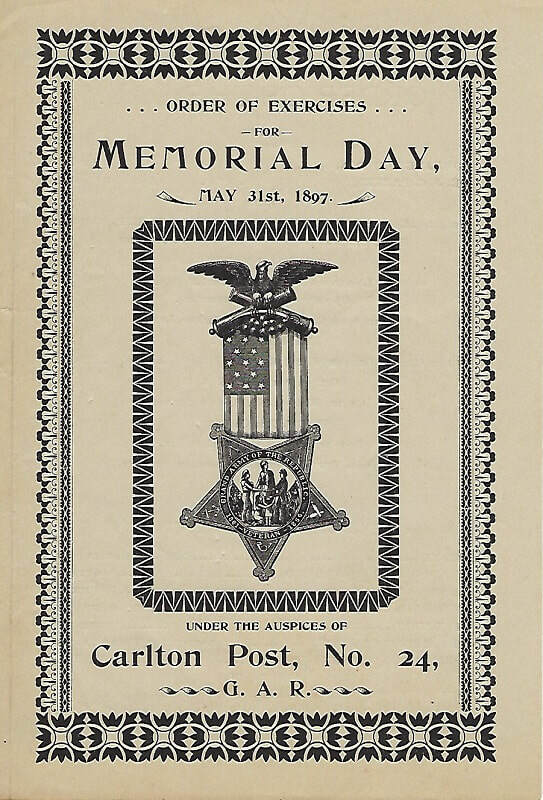 There is more to read about the Provost Guard and the Eureka Powder Works on the 16th Annual Encampment page. ​​While some of the participants have come and gone over the years, and the displays have been changed at times to add variety, the overall outcome of this gathering remains the same: to give the visiting public a chance to see the daily life and routines of a Civil War soldier. It also gives us reenactors the ability to "walk in their shoes" and relive the 1860's, if just for one weekend. For those of us who had ancestors that served, having such an opportunity to spend this time as they may have, is an experience like no other.